A renegade Ordo Hereticus Inquisitor carrying a psyocculum is hunting the battlefield for Mephiston. The inquisitor is joined by his trusty squad of psyker henchmen with the Psychic Barrage (large blast) power. Assuming they pass their psychic test, what are the odds that they will hit Mephiston? Right, blast weapons use the scatter dice described here. At its most basic, a 33% chance of a hit, and 67% chance of a miss; if you miss then it scatters 2d6 inches but unlike deep striking you can subtract the firing models Ballistic Skill (BS) from the 2d6 result. So if you roll a ‘miss’ but get a distance less than or equal to your BS then that miss becomes a hit (i.e. you don’t scatter). Naturally this means that the higher your BS, the more ‘misses’ get converted into hits, and if it does scatter then it won’t scatter as far. To show the effect of increasing BS values I’ve pulled together a 3d plot. 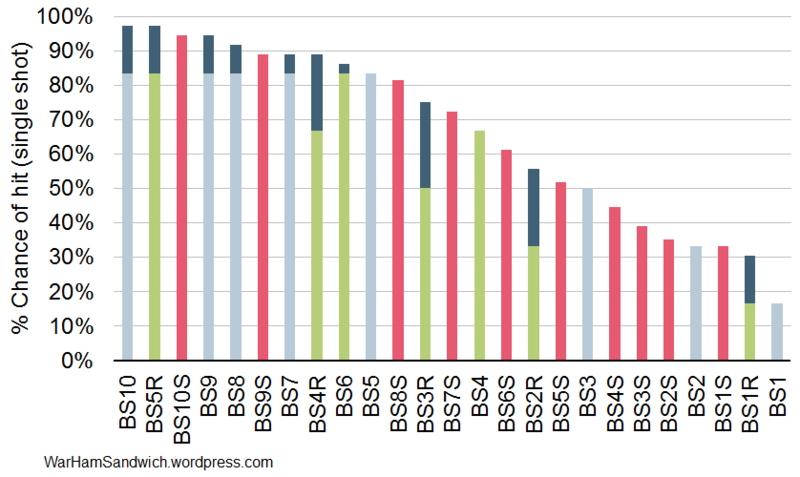 So each colour represents a BS value, from BS0 at the front to BS10 at the back. The odds of a particular result go from left to right, so taking BS0 as an example, the odds of a HIT is the leftmost blue column (at 33.33%) and the odds of a particular scatter are to the right, e.g. a 2 inch scatter has a probability of 1.85% (for BS0) and a 7 inch scatter would be 11.11% likely (for BS0). the foreground numbers are a HIT (leftmost) or a particular scatter distance (from 1 to 12 inches). Since the the BS value is subtracted from the scatter distance, you can clearly see the maximum scatter get smaller with each step increase in BS. So looking at the BS10 scatter (all the way at the back in pink) it’s a 94% chance of a hit, 4% chance of a 1 inch scatter, and a 2% chance of a 2 inch scatter. Given that the the psyocculum gives our Psykers BS10, is that the answer to the question, a 94% chance of hitting Mephiston? Not quite, theres one more factor to take into consideration. Blast size. The regular blast has a 1.5 inch radius, and the large blast has a 2.5 inch radius. Against a vehicle, only the centrepoint of the blast gets you a full strength hit, but against infantry just clipping the base with the blast template is enough for the full whack. So in terms of hitting Mephiston, it’s 2d6 scatter minus 10 for BS, and (effectively) minus another 2.5 inches for the radius of the large blast. So we’re subtracting 12.5 from a number that is at most 12, simply put they can’t miss! There aren’t many mechanics in the game that can say that. The only caveat is that the extra bit of reach from size of the radius doesn’t get you a ‘full’ hit as it doesn’t land exactly where you placed it. You’ll definitely hit the guy you were centred on, but you’ll cover different models around him if it does scatter those one or two inches. So, back to more general principles. You may recall my uber list of BS rankings, well I’ve now we can add two new charts to that list. First up, regular BS accuracies with blast accuracies added (in pink). The blast accuracies are the probability of hit but disregarding the radius of the blast (i.e. 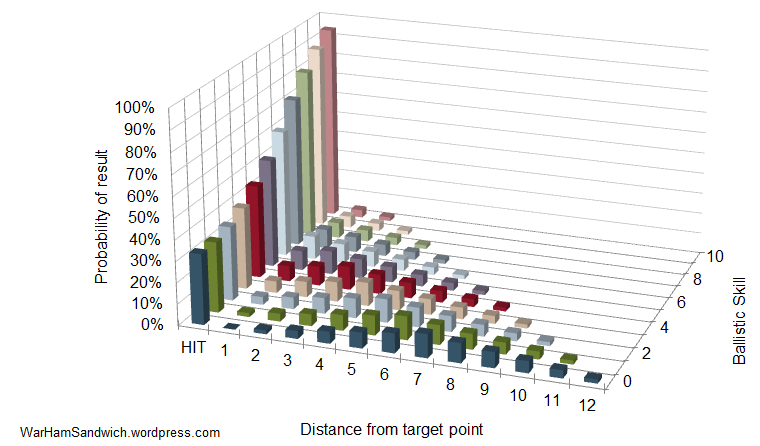 the odds of the centrepoint hitting your desired target point). Blue columns are ‘regular’ shots, green are twin linked, and pink are blast. Hmmm I guess I left out twin linked blast, guess that’ll have to wait. Secondly looking specifically at the effect of the radius (no ‘normal’ i.e. non-blast shots on this one) . So these are the odds of hitting with just the centre (in pink), versus blast (in blue), versus large blast (in green). 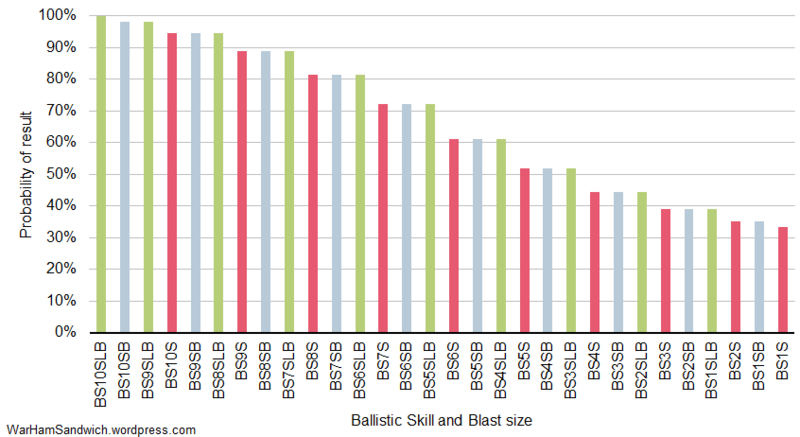 The pattern is actually pretty simple: BS10 centre is as accurate as BS9 blast, is as accurate as BS8 large blast (and so on down). Essentially each step up in blast size is equivalent to a one point increase in BS. So there you have it – I thought I had all the BS covered, but there was still more to do; …always more to do. This entry was posted on Tuesday, August 23rd, 2011 at 7:44 pm	and tagged with 40k, ballistic skill, blast, large blast, probability, scatter dice, statistics, Warhammer 40000 and posted in Probability. You can follow any responses to this entry through the RSS 2.0 feed.